As a home owner, I’ve seen various methods of estimating annual home maintenance costs. These methods involve calculating a percentage of your home value – usually between one to four per cent, and using that value as the annual maintenance estimate. Being a bit of a skeptic, I never had much faith in these estimation methods, since there is never any kind of logic to them or analysis supporting the numbers. It doesn’t make sense to me that your home value should determine maintenance costs, especially if you live in an area where the land value is the majority of your house value. The cost of maintaining your land is far less than the cost to maintaining a house. Another problem with these estimates is that a poorly maintained, older home will be worth less and consequently have a lower estimated maintenance cost than a new, well-maintained house – clearly this makes no sense at all, since the poorly maintained house will likely need more maintenance and should have a higher estimated maintenance cost. A third issue is that from a budgeting perspective, home maintenance often involves high cost items that occur infrequently. For example; a $12,000 roof that lasts roughly 20 years. Calculating an annual cost for that roof might be an interesting exercise, but it’s unlikely to actually help you efficiently budget for it. And will you still be living in that same house 20 years from now? Rank the house components in order of increasing estimated remaining life expectancy and then plan for any expenses expected in the next five years. The next step is to determine the estimated life spans. Here is a source for the life expectancy of home components which has good data. Then we find out the current age of each component. The current age of most of my items was fairly easy, since a lot of them were replaced just after buying the house. For older items, you can often look on the component itself to see if there is a date on it. Windows, furnaces, air conditioner, hot water tanks should all have a date on them somewhere. If you don’t know the age of an item, just take a guess. For example if you bought your house 12 years ago and haven’t replaced the roof, there is a very good chance that the roof is at least 12 years old. 🙂 If the roof isn’t falling apart or leaking, it’s probably less than 20 years old. Pick a number halfway between 12 and 20, say 16 years and there’s your estimated roof age. Now we need to figure out the replacement costs. This can be difficult since there can be a wide variety of options when replacing an item. I wouldn’t worry about trying to get accurate figures – for this exercise, any reasonable guess will do. Once you get close to replacing a component, then you can worry about the exact cost. Check here for some cost estimate guidelines. If you are really clueless about how to collect any of this data, see if you have a copy of the original inspection report which should contain some of this information. A more expensive option is to hire a home inspector to check out your house – they can give you an idea of the condition, age and replacement cost of the various parts. Finally, I need to calculate the “Remaining life expectancy” for each item by subtracting the current age of each item from the life expectancy. For example if my roof is 14 years old and the life expectancy is 20 years, the “remaining life expectancy” will be 20 minus 14, which is six years. 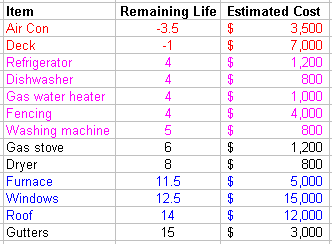 Here is a table showing all my major maintenance costs, ages and life expectancies. 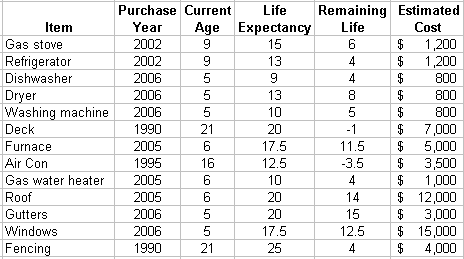 Note that I put in a “purchase year” for each item, so that I can look at this table again in a few years and the current age (calculated) will be automatically updated. Most of my estimated costs are very ball park. Just for fun, I took all the items, calculated an individual annual cost and summed that up to get an idea of my average annual maintenance costs. It came out to $3,186 per year. Throw in a few bucks to cover smaller maintenance costs not listed and my annual house maintenance costs are $3,500 per year. But as we’ll see later, that annual figure is not very useful for planning or budgeting. Now that we have all the data we need – let’s rank all the items by the remaining life expectancy so we can get an idea of upcoming maintenance expenses by time period. I suggest that you focus on the next five years only. Beyond that is just too far in the future. Most single maintenance items are not so expensive that five years isn’t enough to save up for them. Look at any expenses in that five year time period and think about how you can plan for them. If your budget is tight and you need a furnace in four years, setting aside some money each month might be a prudent idea. On the other hand, if you have a high savings rate and a decent emergency fund – perhaps you can wait until closer to the actual replacement date to save some cash or even just buy on credit and quickly pay back the loan. The estimated life expectancy dates are not very accurate, so you don’t want to have $5,000 cash sitting around waiting for a furnace to die, if you have better uses for that money. It’s also worthwhile to look beyond five years for the case where there are a lot of items up for replacement at the same time (“expense cluster”). This situation could require more advance planning (which could include moving). This might happen where someone moved into a new build home or did major renovations. Maintenance items by time period. I’ve ranked the items by the expected expiry dates. While I’m mainly going to focus on items that need replacing in the next five years, I’m also going to note the “expense cluster” that I’m going to face in about 12 years. Now I will look at the list and do some planning. Air conditioning – This item is old and could die any minute. However, it works fine and I’m not planning to replace it until it stops working. Because of our emergency fund and high savings rate, the $3,500 replacement cost will not be an issue. Action plan: Monitor indoor air temperature on hot days. Deck – My deck might actually be a funny story if it belonged to someone else. It is ancient – I’ve estimated it’s 21 years old, but it could be 50 for all I know. Every year I replace a couple more rotten boards. The reason I haven’t replaced the deck is because we have water problems with our basement that will be addressed in the future. There is no point in getting a new deck if we might need to dig up around the house for water proofing. When we tackle the basement project, a new deck will be included in the budget at that time. Action plan – Keep rebuilding deck one board at a time. Refrigerator, dishwasher, gas water heater, washing machine – These items have a total replacement cost of almost $4,000, which is not a worrisome amount. Given that the estimated expiry won’t happen for at least four years, I’m not going to worry about these expenses at this time. Action plan – Nothing. Fence – This is another item I have no idea of how old it is. It’s not in bad shape and the reality is that I will probably just do small repairs if it starts having problems. It’s extremely unlikely that the fence will get replaced anytime in the next ten years. Action plan – Don’t lean on fence. All the remaining items have expiry dates that fall outside of my five year window of concern, so they will be ignored for now. I will take note of the last four items in the list – furnace, windows, roof and gutters. These items represent $35,000 of costs within a 3.5 year window. This is what I was referring to when I mentioned the idea of an “expense cluster“. This expense cluster will eventually require some planning, but it’s still too far off (11+ years) to plan for now. It’s likely that we’ll start saving an extra $5,000 per year starting a year or two before the cluster hits in order to be able to pay for those expenses. This exercise shows why an annual maintenance estimate is not very useful. In my case, I don’t have a lot of costs coming up in the next several years, so if I saved $3,500 per year – that cash would be sitting around doing nothing. I’d much rather put it into my mortgage. Conversely, if you have a house where there are a lot of upcoming expenses, the $3,500 per year budget probably won’t be enough. Because I have a decent emergency fund and a high savings rate, I don’t need to do any kind of special budgeting for house maintenance now, since I don’t have a lot of costs coming up in the next few years. Someone with a tight budget might have to set aside a “house maintenance” fund to handle these costs. Every house will be different – It’s important to analyze the components of your house in order to plan out your future house maintenance costs. This concept of future budgeting can include items other than house maintenance items. If you are planning/hoping for renovations in the future – add them on the “maintenance calendar” as well. Even big ticket non-house items like new cars, “trip of a lifetime” vacations can be added in. Specific budgeting for future items is not always practical. If you just bought a new roof for $10,000, are you really going to start saving $500/year in a “roof fund” for the next 20 years? That’s just not a good use of your money. One of the best ways to deal with future expenses where it’s not certain about the timing is to have an emergency fund and a high savings rate. Anything you can do to improve your current financial position will help you deal with future expenses. As I discussed in this post; How to value real estate, the land value can make up a majority of a house purchase price. Especially in an urban setting. Using a percentage estimate for a maintenance budget means that a home owner in a popular area will have a higher maintenance estimate than someone who lives out in the country and has a lower land value. For example – Take a two-story 1,200 square foot house. Let’s say the house value (not counting the land) is $150,000. If this house is sitting in an expensive area of Toronto, the total value might be $700,000. If the house is out in the country, perhaps the total value is only $200,000. If we use a maintenance estimate of 2% of the house value, that gives us $14,000 per year for the big city house and only $4,000 per year for the country house. Given that this estimate methodology gives us two very different results on identical houses indicates that it’s quite flawed. Older, crappier houses will negatively influence maintenance estimate, but probably need more maintenance. If we ignore land value, a house that is in great shape will be worth more than a run-down house that needs lots of maintenance. The percentage estimate will incorrectly conclude that the run-down house needs less maintenance, which is nonsense. Example – Let’s take our $200,000 country house which is made up of $50,000 land and a $150,000 house. This house is very well maintained. Let’s say there is a very similar house on the adjacent lot, except this house is much older and hasn’t been well maintained. The second house is only worth $150,000, which is made up of $50,000 land and a $100,000 building value. The percentage estimation method will tell us that the well maintained house should have an annual maintenance budget of $4,000 (2% of $200,000), but the run-down house only needs $3,000 per year (2% of $150,000). This is clearly incorrect, since it’s very likely that the cheaper house will need more maintenance. How do you budget for home maintenance? Anyone else miss the good old “rental” days? Extremely thorough analysis. I hadn’t thought to put my home maintenance costs down on paper and track them. Having moved into a new (old) home recently I will need to figure out how old all of these big ticket items are ASAP. The hot water heater has to go soon, I know that much! I hadn’t really looked at basic maintenance costs either – mainly because I knew we didn’t have anything big coming up in the near future. But the “percentage of home value” estimate thing really annoyed me, so I thought it would be fun to use my house as an example of how to calculate it more accurately. Awesome post. I moved into a 12-year-old townhouse recently, and know that eventually, I will have to replace my appliances. It’s something I vaguely thought about when deciding how much to save for maintenance costs each month, but I think I’m going to have to go over it more thoroughly after reading this! Your point about house value vs land value is a good one, but to some extent there is still a fair bit of validity to the percentage rule-of-thumb: for the decrepit house, to maintain it in a decrepit state probably costs less than maintaining a pristine house in a pristine state. Sure, I may have to fix the roof and the furnace and the fridge and the windows of my decrepit house sooner since they’re already at the end of their lives, but I can push out their lifespan so that at the end of 30 years the house is just as decrepit as when I first got it, whereas to keep the nicer house nice, I might need to replace those items twice in that 30-year span. @Potato – Those items aren’t really essential – paint, remodelling etc, although they can be added to your maintenance budget if you want. I don’t really agree though – things like the furnace don’t add or subtract to the decor of a house, so holding off on replacing a furnace that doesn’t work, won’t maintain the decrepit status quo. A leaky roof can be useful in order to keep the quality of the house down, so that is a good point. Well done Mike! Very detailed analysis. I like your process and the way you think. Thanks a lot Jim – I appreciate it. Good point on not using the percentage of home value; you just can’t use one general assumption for all houses. We just bought a brand new house, so if I were to make a spreadsheet listing everything that will eventually need replacing, I would look a lot further out than 5 years. But as you mention, that might not be very beneficial since it’s too far in advance to make any real decisions. Right now, my home maintenance budget consists of only one item; finishing the basement. We’re not in a rush, but this will be done in the next 2 years. Why not just get a home warranty to cover the expenses for most of your appliances at home? It may take some research time up front but will save time for term of the contract. Sure, it does not cover everything in the house, but every little bit it does cover does help plenty! You could throw furniture in there as well. A lot of heavily used furniture has a pretty predictable replacement cycle. Ie, couches every 7 years or so. Perhaps beds as well. Televisions/home electronics. I’m not sure I agree with a negative expected time till failure/replacement. Yes, the item might be past its life expectancy when new, but now that it is X years old, it’s expected life expectancy is now later. Same goes with people. The longer you live, the higher your total life expectancy rises, necessarily. Yeah – there isn’t much point in worrying about this stuff with a new house. Maybe if you can get the mortgage done sooner, that will free up cash for the inevitable crunch in 15-20 years. @Shri – Not sure if a home warrantee will cover things like 20 year old furnaces dying. @Andrew – As I mentioned in the post, you can add whatever you want to the spreadsheet. I tried to focus on the essentials for the case study to keep it simple. I’m not sure about the negative life expectancy thing. I don’t know if there are age mortality rates available for appliances similar to the ones available for people. Interesting idea though. Great job providing such a detailed post. I think it’s a great idea for home owners to have readily accessible funds in the advent of issues that may present themselves. My wife and I took advantage of the renovation tax credit a couple years ago and renovated our bathroom. We figured it was a good way to reinvest in our home, save money in doing so, and lessen the future maintenance burden. Every year, I find there’s at least something that creeps up that you weren’t expecting. It doesn’t have to be something excruciatingly expensive, but I think most home owners would agree, there’s always something that needs to be done around the home. This summer I had to invest time on my lawn because of weeds, and when we got the tail end of Irene, my garage roof needs to have it’s shingles replaced next summer. @WC – Yes, it doesn’t hurt to have extra money to cover opportunities. @Mike: at least for the hot water tank and the furnace there is a form of insurance. It’s called “rental” :-). But in most cases it’s not cost effective. Thank you Mike. This is fantastic. I live in a condo and have fewer repairs to consider but this really helps to put future costs in perspective. I have created a small table in excel with formulas and would be happy to share it with to share with your readers if you are interested. I use today’s date in my formulas so the table is automatically updated. You are definitely missing a lot of items in your house. Everything in your house depreciates and nothing lasts forever. For example, you might consider a kitchen or bathroom reno unnecessary, but eventually you need to replace counter tops, cabinets, sinks, toilets, flooring, etc. And eventually you will need to re-paint and do other repairs. You can estimate the replacement cost of your entire home by multiplying the finished square feet by average new home construction costs ($100-150/sq ft) and then depreciate this number over 25 years or so. Also, a lot of municipalities while show breakdown your property assessment to show dwelling values vs property. @Noah – I indicated in the article that I was only including large items from my house that have to be replaced. I also mentioned you can add in any other items you choose. 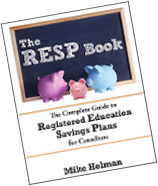 The problem with using the replacement cost amortized is that it will include a lot of costs that will never have to be replaced. Ie the subfloor etc. Another problem is that it leaves you with an constant annual maintenance cost which likely will not have any bearing on reality, which is the whole point of my article. Great analysis here. I haven’t done this detailed of planning yet, but that is because I am still renting and saving up for my first down payment. I have used a similar method with my financial goals and love it. Some people may not want to plan this much and it might be more beneficial for them to estimate high and plan for the worse. I think you are right that people who don’t want to plan should overestimate. Hi Mike, you have it wrong. A mainenance cost is something to maintain something not replacing something. Replacement of items like fridge, stove, washer and dryer is NOT a maintenance item unless you have had them serviced which would be. Same goes for roof repair (as in replacing a few shingles that were blown off) is a maintenace cost, completely replacing a roof is not. the list goes on. Just think of it this way; what is included a capital cost vs maintenance costs. Bert – I don’t disagree with your definition of “maintenance”, but it seems that the popular use for that word is to include anything that wears out (ie new roof). I find the same thing with car “maintenance”. For example, I don’t consider buying new tires or new brakes as maintenance, however it seems that most people do. This is a great post. I think many people underestimate the amount of money required for maintaining a house. They factor in items like repairing the roof, painting, resealing the driveway, etc but often forget about critical things such as servicing furnace, water heater, AC, or even painting and keeping the home `fresh` so to speak. A property can start to look tired very quickly if it isn`t properly maintained. The money put into regular maintenance will easily pay for itself in resale value when it`s time to sell. Keynote, I don’t think that this is a great post as people have this concept that “maintanence costs” include items that aren’t a maintenance cost item. ie: replacement of applinaces, and reno’s.. Sorry those aren’t cost to maintain a building. If people followed the CCRA’s rules regarding maintenance costs and what isn’t this, then this issue regarding maintenace budgets won’t be such an issue. The criticism of using a flat % of the home value states that a house in one locale may have a market value of 150,000, yet in a more affluent are, it could be 700,000 (kind of extreme, but still useful). The commenter assumes repair costs are uniform by locale, and this is absolutely not true in our part of the country. If you live in an affluent area, not only does your house cost more, but repairs cost much more. So, I wouldn’t abandon the flat % approach merely on these grounds. I’ve always felt that houses, as large capital expense items, need to be handled as ships. They need logbooks to record everything from the initial building through additions, repairs, appliance changes. But, like actually labeling wiring, this hasn’t occurred to builders. I’d build them into fireproof safes in each house, with data duplicated in back-up electronically in secure cache. Properly done, a fully electronic version could schedule maintenance, check for equipment upgrade deals and changes in efficiency and both track and project maintenance and replacement capital expenses, adjusted for current market values. Houses are not assets, unless you are selling them. Then they are worth what you can get. That may be far different from what you paid, you may well lose everything. Of course, if you rent, then there’s no possibility that it will result in any residual value. Bert: I believe the real issue is household maintenance. Most people view appliances as ‘part of’ the ‘house’ environment. Great post. Would like to see Android and iOS apps to help take the complexity down a notch while still allowing everyday users a shot at understanding the implications of home ownership. Could easily be supported by home improvement ads targeted at the items in need of repair as they come due. Take into consideration local cost factors based on location, etc. I’m too old to do this but there’s something here for an entrepreneur. I just started looking into this topic, and as soon as I saw all the nattering nabobs all doing the 1% circle jerk, I knew a fresh perspective was needed. Here it is, thank you. Of course, like all the readers, I have some different perspectives. Like a mechanically perfect car with bad paint, a house can function just fine w/o a dishwasher or laundry machines, but I think it safe to say that we all want/need a refrigerator. Which, ironically and unlike a dishwasher, not even really part of a home. Some things just cannot be predicted. My family had a home in Florida for 55 years, my father, then us bro’s major DYI’ers. My father installed the original AC! The furnace was fuel oil, probably only coal would be higher maintenance. Minor repairs were needed along the way, mostly involving the thermostat and controls. The cast iron heat exchanger never leaked. Was running fine when sold after 59 years of use. On the flip side, that was Florida, not Montana. You cannot predict AC lifespan. The most common failure is a $15 run capacitor (no, it is NOT a start capacitor) and I’ll bet many an unscrupulous technician convinced the owner it’s old, time to replace. My brother finally had to replace his entire system very recently. It ran for 35 years! Yes, with maintenance. But also, a reverse cycle heat pump, so it was running in the winter, too. On the flip side, I’ve seen a compressor die in two months, no warranty on freon or labor, and a new, high SEER unit die in a couple of years……..just out of warranty. Then there’s the matter of buying new and doing nothing yourself. My brother found good used units, bought his own big bottle of R-22 to avoid the freon ripoff, and then had a contractor do the job. He had to do all the research and purchase leg work, drive a few trips, but it was done for $1000. Or, buying used. I would literally NEVER buy a new refrigerator, even if I could afford one. I use several almost new refrigerators frequently and they are so far off of the core mission, hey, keep it cold, alright? And digital controls? Presuming you can still buy a PC board when you need it, you WILL need a technician with his specialized scanner. Otherwise, it’s scrap. My sister gave up on a rather simple digital controlled oven and we put in a 1950’s GE electric. Works every time. So, bottom line, there are more variables to plug in than we can really use to arrive at something definable. Oh, home warranties? Put your premiums in the bank. Mine gets out of the big ones by providing, after a lot of hassle, a refund on the PART if they deem it’s not longer of enough value to include labor. Willing to refund my disposal purchase, I did it myself. I asked about my electronic range. Sure enough, if the repair is more than $500, too bad. Go look for a good used one, Paul. Windows? Countertops? Cabinets? Really? Those are lifestyle preferences, not maintenance. But again, thanks for a good, thought provoking article.